European Rover Challenge 2015 – ABM Space Sp. z o.o. 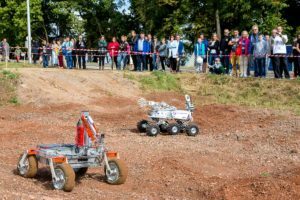 On 4th, 5th and 6th September 2015, in the Regional Science–Technology Centre in Podzamcze near Chęciny, European Rover Challenge 2015 is held for the second time. Yet once again ABM Space posted jury for ERC competition. This year edition is also an opportunity for meeting with representatives of space industry and The European Space Agency.